Last friday we lost Grace for a few minutes. Bailey went to a friend’s house and left the front door open as she left. We didn’t hear Graces voice like we normally do (every minute or so). When I saw the front door was left wide open I scrambled my shoes on my feet and grabbed my noble sidekick, Jack. Grace has a history of walking off. She’s a free spirit. We’ve never lost her but when I saw that door wide open I thought her wanderlust might have found it’s opportunity. Jack and I started searching the back yard. She wasn’t there. Jack ran up the street. I ran down the street. Not there. I panicked. We drove around the block and searched and hollered for her. I never panic. I’m not easily taken to that behavior. This was an exception. I was frantic. I quickly devised a strategy find her. I’d knock on the neighbors doors and ask for their help. I thought about posting people at the exits to the neighborhood. I saw in my mind’s eye the sun setting without finding my precious Grace. It was terrible. That’s when I got a glimpse of Sam waving us back home. Grace was found. My heart slowed to 100 beats per minute as I pulled into the driveway. She wasn’t missing. She was happily working on an art project that would rival anything that she had done yet in her short career. I have a white desk with a mug full of pens. In that mug is a Sharpie permanent marker. Grace snatched up that pen and decorated my desk. You can tell that she spent some time there. The large gestures of swirling marks were probably her first move. Then the details of circles and little faces were her last bits of detailing. It’s an impressive piece of work. 3 feet long and 2 feet tall. It’s positioned exactly where I sit. That’s where she knelt on my chair as she worked. I was so happy to see her happy face and curly hair. I held her and rubbed cheek on my cheek. 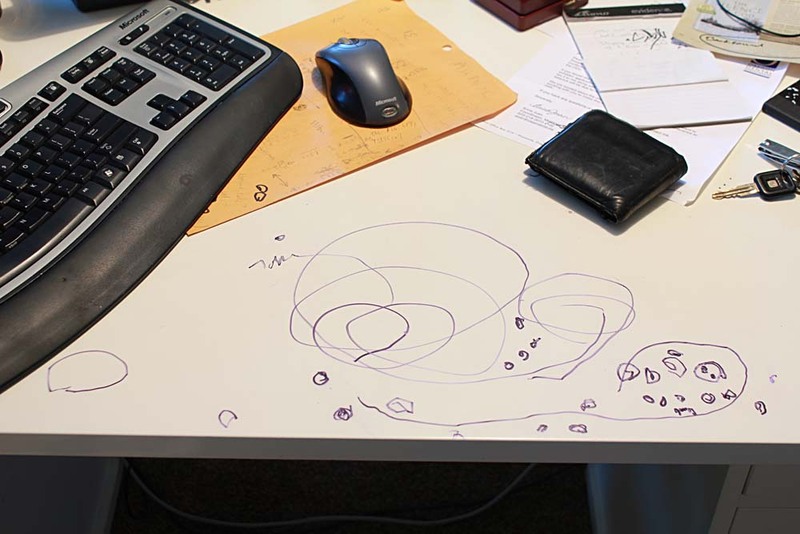 I decided that a custom designed desk was a gift from my 2-year-old daughter. It was amazing how my gratitude prompted my positive perspective about my desk. I’m not going to remove the artwork. I’m going to keep it. It’ll remind me about how lucky I am. Previous Photo Classes! Photo Classes! Photo Classes! Photo Classes! Photo Classes! Keeping the artwork: Good man. Dude, you totally got hooked up on that custom desk piece. Kate took her rocking chair to the next level the other day. These are the good days amigo. It’s pretty nice, no? They are the good days. Miss chattin with you at the vietnamese place. Hows life in Chicago? Glad you approve. It’s a strong visual statement on my desk.